In a survey of over 1000 California beachgoers, Hipp and his team found those who experienced the most stress in daily life found the beach the most psychologically restorative. But not all “blue spaces” are the same, Ripp and his team found. The level of restorativeness of coastal parks is dependent upon environmental quality. “Mild temperature days and low tides offer the most restorative environments,” Hipp said. The odds of finding the beach psychologically restorative were 30% lower during high tide, possibly due to less sand and more crowding. 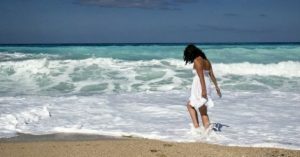 Beachgoers were also three times less likely to find their visits rejuvenating if they perceived poor air or water quality.